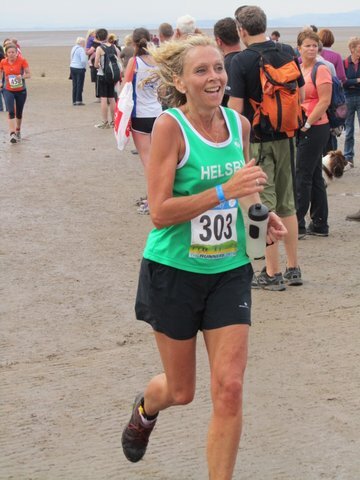 It was a busy weekend for Helsby runners, a mixed bag of results and races for those out and about. Jimmy and Phil had great runs in the tough North Wales fell race ‘Gladstone 9’ on Sunday. A much deserved top ten finish for Jimmy showing his continuing improvement on the hills. ‘Baking hot’ for them heading out and I believe a bit windy heading home but the rain did hold off thankfully. Results and photographs of the day below. Once again we can thank Alistair for being out taking shots. Also on Sunday was the Nike Challenge 10k, a 24 lap track race near Cheshire Oaks. I know of at least one PB from the ever improving and tenacious Tom, hitting 43.04. Not long till Tom heads towards the 40 minute barrier I bet. Colin had a stormer for another sub 40 and 6th place overall and Roy ran well too finishing in front of Tom. What’s great about this result is that Colin, Roy and Tom are newer members of Helsby all getting better each race and I think helps to show training with people does make a difference. Would love to have some feedback about how different racing on a track is for that distance compared to road so please let us know. The ever energetic Jackie has sent a couple of race reports as below. After running a trail half marathon on Sunday she was still zooming round track doing sprint relays on Monday night! Firstly somewhat belated, the Trail counter, The Gritstone Tryal on July 29th was a 13 mileish orienteeringish event around the Staffordshire borders, taking in parts of the Gritstone Trail, The Dane Valley and the tussocky Roaches. A map was given out to study an hour before the start for us to work out the fastest route linking 5 well spread out check points. Most runners went the same way to check point 1, but various routes to checkpoint 2 about 7K away were taken. A number of the faster runners re-traced their footsteps (as I was still slowly approaching checkpoint 1) to go a longer but “faster” way along the river Dane. I took the more direct hilly route and was only overtaken by them close to checkpoint 2! So speed is not everything in these races! On towards the Roaches where a short cut I took resulted in a mix of bracken & bramble & cut legs to tell the story. Finally a tussocky pull up to the top of the Roaches. Thanks Andy (Robinson) for telling me beforehand that it was better to stay on the road as long as possible as the tussocky terrain was impossible to make good progress on. A really good race with a difference. 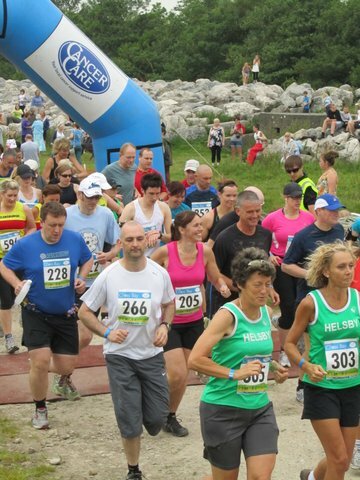 Shame only 30 runners in total entered, a good one to support with Helsby runners next year? 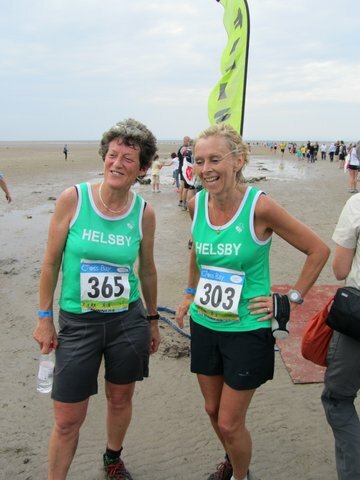 Yesterday, Sunday 12th August, the tides were set right for the Cross Bay Challenge Half Marathon across Morecambe Bay from Flookborough near Grange over Sands to Hest Bank near Morecombe. Note: The only known race in the world to cross a tidal bay! Historically the quickest route from Cumbria to Lancashire at low tide, the bay crossing dates back to the 13th century when monks from the local abbeys served as guides to travellers. Direct it’s only 9 miles so to make it a half the route took us on a tour of the bay, winding and splashing in and out across the sands past Grange towards Silverdale before turning and heading in a huge loop out towards the main channel and finally back to Hest Bank. High winds and a spell of heavy rain in the middle of the bay, which was ankle deep in water anyway, with no land visible on either side was quite exhilarating to say the least! Then followed the crossing of the river Kent channel which was thigh deep and fast flowing involved quite a bit of concentration. At one point Nesta pointed out a boat that separated us from visible land, an eerie experience! After 8 miles we turned downwind, the sun came out and we were running on dry solid sand so the pace picked up. One of the slowest yet totally flat races you will ever do. Its in Nesta’s 100 races to do before you die book and well worth a try!